Motorised Outdoor Roller Blinds & Folding Arm Awnings in Perth. In the business of making folding arm awnings and motorised outdoor roller blinds, Blinds by Peter Meyer offers the city of Perth a premium offering. We are the largest producer of custom-made window furnishings for the building and design industries in Australia. Headquartered in New South Wales, we are proud to have built an excellent reputation in the business. Homeowners and professionals alike can attest to the state-of-the-art technology Blinds by Meyer has deployed to add form and functionality to any space using innovative solutions like never before. Perth’s climate is somewhat similar to the Mediterranean and thought to be one of the sunniest cities in Australia with 8.8 hours of sunshine a day. Throngs of people flock to their sandy beaches to bask in the sun with temperatures averaging 29 degrees celcius on a typical day and sometimes reaching 40C and above at the peak of Summer. In these circumstances, the perfect shelter from the blazing sun comes in the shape of motorised outdoor roller blinds and folding arm awnings produced by Blinds by Peter Meyer. On the back of a five-year warranty comes the Solare Teknica outdoor roller blind. With the competitive rates of the Solare Teknika, our clients are assured best value for money. For individuals who desire their entertainment area to be somewhat bug-free, we recommend the T5000 Side Retention because of the fabric zip locked into the side channels. We also recommend the T5000 Side Retention for areas that are in need of withstanding high-wind. Alternatively, the T1000 Straight Drop is perfect for those of you who are looking for a more sleek and simple aesthetic. No matter what you choose, both models have superior quality and makemanship and are some of the best-selling motorised exterior roller blinds in Perth. 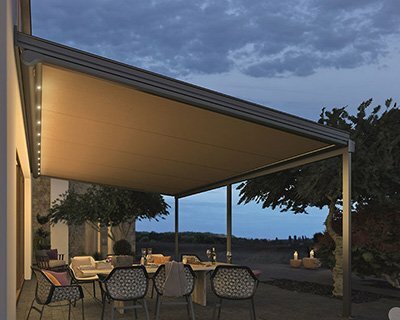 In Perth and across Australia, Blinds by Peter Meyer is the exclusive distributor of Weinor, working via our network of dealers across Australia to make Weinor folding arm awnings available across Australia and New Zealand. Weinor’s smooth design conceals and protects the awning offered by the full cassette style of this super, German engineered brand. Cutting-edge Somfy technology powers the motorisation of folding arm awnings. In Perth, the top selling folding arm awnings are the avant-garde style Zenara, the brand new Semina Life, and the Opal II cassette awning. Why Choose Blinds by Peter Meyer? In Australia, New Zealand, and Singapore, the most well-known brand that specialises in the design, production, and distribution of state-of-the-art blinds is Blinds by Peter Meyer. A steadfast commitment to a gold standard of excellence via a strict organic growth process has seen our family-owned company last for 30 years. The innovative solutions for the building and design industries continuously produced by Blinds by Peter Meyer’s product development team is a testimony to the teams consistent and continuous efforts. Blinds by Peter Meyer is famous for its world class quality products, and extensive catalogue of trusted custom-made blinds. Explore our website now for more information on Perth’s Blinds by Peter Meyer’s motorised outdoor roller blinds and folding awnings.